In order for subcellular processes to be carried out within defined compartments or cellular regions, mechanisms must exist to ensure the required protein components are present at the sites and at an adequate concentration. The accumulation of a protein at a given site is known as protein localization. SRP (signal recognition particle) interacts with the signal sequence as soon as it emerges from the ribosomal polypeptide exit tunnel (1-2). 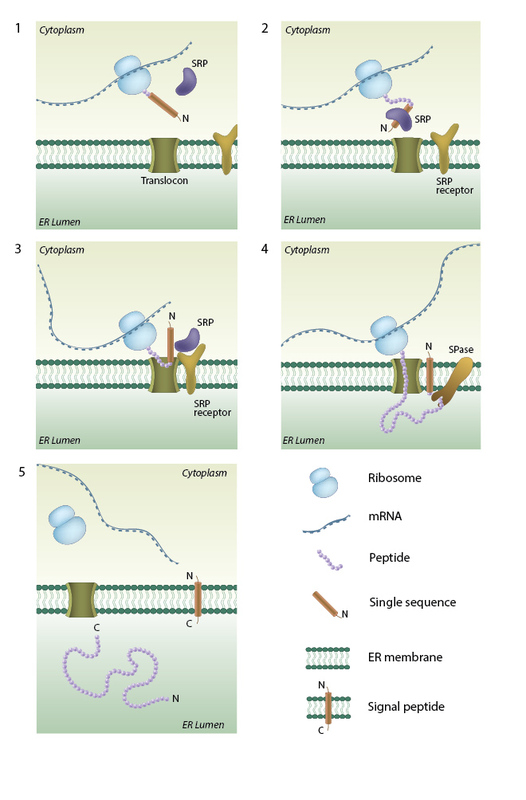 In eukaryotes peptide elongation pauses upon SRP / ribosome nascent chain complex formation; the complex is then targeted to the ER membrane by the interaction with the SRP receptor (3). GTP binding to SRP and SRP receptor is a prerequisite for SRP / SRP receptor complex formation. Following the complex positioning (3), SRP / SRP receptor complex dissociates from the peptide due to GTP hydrolysis. The growing peptide is gradually transferred via the protein-conducting channel (the translocon) into the ER lumen (4). Usually, signal sequences are cleaved off co-translationally by SPases (signal peptidases), and the resulting cleaved signal sequences are termed signal peptides (4-5). Protein recruitment is essentially a form of protein recognition, made possible by the presence of specific amino-acid sequences within the protein structure. For example, many membrane bound proteins carry signal peptides that are recognized by signal receptors that guide them to the target site. The nuclear localization signal is one such example. Proteins that are destined for the endoplasmic reticulum also carry a signal peptide. In other cases proteins may carry a signal patch. This usually consists of about 30 amino acids that are not present in a linear sequence, but are in close spatial proximity in the 3-dimensional space. Interestingly, the organization of a cell, and its various regions, do play a role in directing the recruitment of proteins to a given site. For example, in epithelial cells, which are polarized, protein composition at the apical membrane is very different from that at the basolateral membrane. This is achieved through the recognition of distinct signal sequences that target proteins to each of these regions. For example, apical membrane proteins are very often anchored to GPI (glycophosphatidylinositol) while basolateral proteins have diLeu (N,N-Dimethyl Leucine) or tyrosine amino acid based signature sequences . Cytosolic proteins that are associated with the plasma membranes are often localized based on their interaction with membrane lipids such as the phosphoinositides. Phosphatidylinositol 4,5 bisphosphate (PIP2) is the most abundant phosphoinositide in mammalian cells. PIP2 is enriched in certain regions on the membrane, and due to its ability to interact with the PH (pleckstrin homology) domains of proteins; it can locally recruit proteins possessing such domains. FERM domain containing proteins, that link actin with the membrane, can also interact with PIP2 . Another closely related phosphoinositide, Phosphatidylinositol 3,4,5 triphosphate (PIP3) may also be enriched in certain regions of the plasma membrane. The enrichment of PIP3 has been shown to accumulate at tips of neurons thus inducing cell polarization and axon formation . It is also suspected to induce local actin depolymerization in Dictyostelium cells and influence cell migration  although other studies in neutrophils have indicated its role is in actin polymerization . Additionally, cytosolic domains of transmembrane proteins can attract other proteins present in the cytosol that participate in signaling cascades. For example, Receptor Tyrosine Kinases (RTKs) phosphorylate certain tyrosine residues in the cytosolic domains of transmembrane proteins upon ligand binding to the extracellular domains. The phosphorylated tyrosines attract proteins possessing SH2 (src homology) or PTB (phosphotyrosine binding) domains, which comprise a signaling complex. The curvature of membranes can also enrich proteins of certain permissible sizes and mechanical properties. For example trans-membrane proteins with conical shape such as nicotinic acetylcholine receptor prefer curved regions in the membrane as this relaxes the membrane tension and shape. Sorting of membrane constituents that prefer curvature has been observed in the Golgi cisternae rims thus reducing mechanical stress in the flatter cisternal regions . Proteins containing BAR (Bin/Amphiphysin/Rvs) domain can detect and induce membrane curvatures and also help sort proteins to different regions of membrane based on curvature. BAR domain proteins are particularly enriched in regions of the membrane with high endocytic activity . Protein localization can result from the recognition of passively diffusing soluble proteins or protein complexes; however, this may not guarantee a sufficient concentration of components to maintain a given process. This can impede its completion, particularly when carried out in regions with a limited cytoplasmic volume, such as the tip of a filopodia, or when components are rapidly turned over. A more efficient way of maintaining the concentration of protein components is by their directed delivery via the cytoskeletal network. The cytoskeleton, which is comprised of actin filaments and microtubules, spans the entire cell and connects the plasma membrane to the nucleus and other organelles. These filaments perform many purposes, from providing structural support to the cell, to generating the forces required for cell translocation. They may also serve as ‘tracks’ on which motor proteins can translocate as they carry cargo from one location to another; analogous to a freight train transporting cargo along a network of railway tracks. Delivery of components is primarily facilitated by ATP/GTP driven molecular motors such as myosin V or myosin X, Kinesin or Dynein. These proteins, or homologs of them, have been observed in a multitude of cell types, including yeast, plant and animal cells. The molecular motors dynein and kinesin walk on microtubules while myosin walks on actin filaments. Expectedly, these motors walk in a unidirectional manner, although not necessarily in the same direction as each other. Microtubule based transport has been primarily studied in neuronal cells. Axons can be several microns in length (sometimes even meter-long), so there is a need to transport proteins, lipids, synaptic vesicles, mitochondria and other components along the axon. All microtubules in the axons are unidirectional, with ‘minus’ ends that point towards the cell body and ‘plus’ ends that point towards the synapse. Kinesin motors move along these tracks to ferry cargo from the cell body to the axon. Disruption of kinesin-mediated cargo transport is correlated with several neuro-muscular diseases such as spinal muscle atrophy and spinal and bulbar muscular atrophy . Dynein, on the other hand, plays important role in trafficking cargo in dendrites . Much of our understanding on myosin-based delivery comes from studies in yeast, although mechanisms appear to be conserved up to humans. In yeast cells, myosin V motors are used to deliver vesicles to budding sites . The actomyosin complex has also been implicated in the delivery of secretory vesicles to sites of growth, exocytosis and organelle segregation during cell division . Other myosins that have been implicated in cargo transport include, myosin VI, which is important for the generation, sorting and delivery of endocytic vesicles , and myosin X, which carries various proteins to the tips of filopodia via their FERM domain. One example of a protein transported by Myosin X is β-integrin. Although functionally similar, important differences exist between microtubule and actin based transport mechanisms. While microtubule based transport occurs over long distances, actin based delivery occurs over much shorter distances of 1-5 µm , reviewed in . Furthermore, microtubules play an important role in the delivery of cargo from the ER to the Golgi and to the cell membrane . Actin based transport on the other hand is associated with the delivery of cargo and vesicles to the plasma membrane, with the goal of initiating rapidly growing and retracting protrusions. These protrusions sense and measure the mechanical properties of the microenvironment, facilitating cell migration. With different processes being carried out in separate subcellular compartments, organized across different regions of the cell, intracellular communication is paramount. Such communication, which is described in greater detail under ‘cell signaling’ allows cells to maintain the concentration of specific proteins and within the correct regions, depending on the requirements of a given process or cell state. This ultimately ensures individual compartments function efficiently, and enables one subcellular process to drive another. This ultimately allows a cell to facilitate its primary functions in an efficient and coherent manner. Signaling pathways may carry a signal that originates from outside a cell or from within various compartments and usually involves the translocation of ions, solutes, proteins and secondary messengers. All cells have surface receptors and other proteins to facilitate sensing of signals from the extracellular environment. These signals can be in the form of ions, small molecules, peptides, shear stress, mechanical forces, heat, etc. Once the signal is sensed by the surface receptor, it is transmitted to the cytoplasm usually by means of conformational change in the receptor or change in its phosphorylation status on the cytosolic side. This in turn triggers a downstream signaling cascade, which very often culminates in the nucleus. The signal usually results in change in gene expression profile of cells, assisting them to respond to the stimulus. Subcellular compartments may also possess mechanisms that allow them to regulate each other’s functions. For instance, protein synthesis and secretory activity of the ER and the Golgi is modulated by phosphorylation of proteins or lipids on their membranes by cytosolic enzymes such as protein family A and protein kinase D. Calcium ions (Ca2+) are a common means of such signal transduction. Usually the concentration of these ions in the cytosol is quite low (~0.1µM), but can increase to 1µM upon induction by a signal. The ER is the storehouse of Ca2+ ions and when released in the cytosol they bind to several proteins, modulating their activity. For example, one target of Ca2+ is CaM kinase, which directly influences cell motility and migration by controlling myosin light chain kinase activity.